Guys! 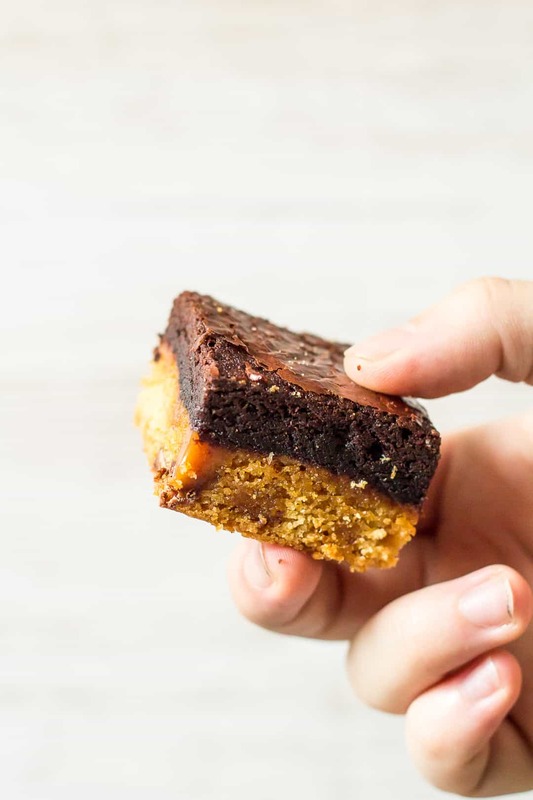 I bring you the ultimate cookie/brownie combination in a recipe that you are just gonna love. 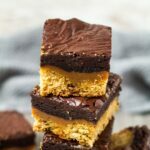 If you love chocolate chip cookies, gooey caramel, and fudgy brownies, then you’re gonna want to try my Chocolate Chip Cookie Caramel Brownies! Firstly, we have a chewy chocolate chip cookie base. 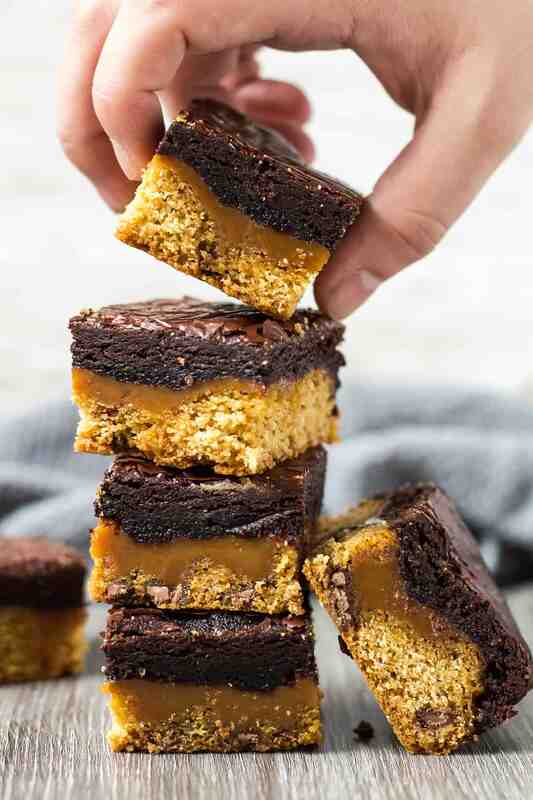 Secondly – a thick and gooey layer of caramel, and last but not least, a layer of fudgy brownie. What’s not to love here? 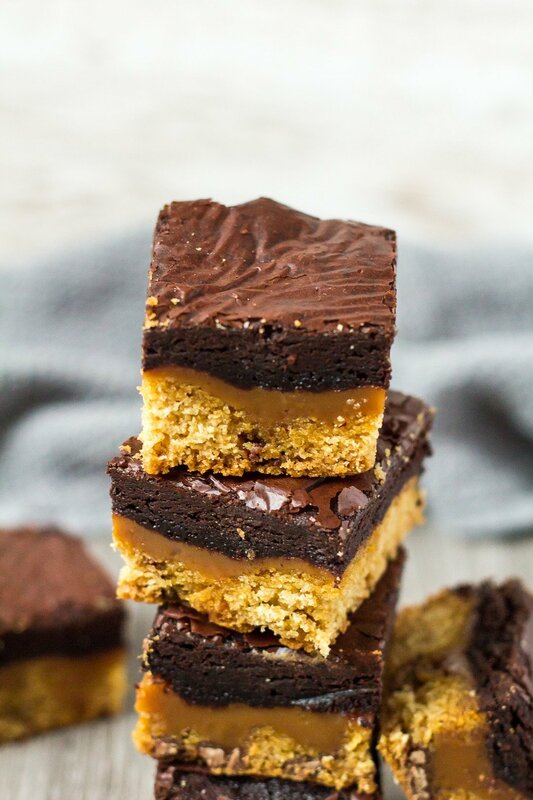 To make these cookie caramel brownies, simply whisk together the flour, baking powder, baking soda, and salt. Set aside. Whisk together the butter and sugars until combined. Add the egg and vanilla, and mix until combined. Add the dry ingredients, and mix until just combined. Fold in the chocolate chips. Press the dough into the prepared pan. The dough may be a little sticky to work with, so use lightly floured hands to press it into the pan. For the caramel layer, place the caramels and milk in a microwave-safe bowl, and heat in 30 second intervals, stirring after each one, until melted and smooth. Pour the caramel over the cookie dough layer, and spread out evenly. Refrigerate whilst preparing the brownie batter. Place the butter, sugar, cocoa powder, and salt into a microwave-safe bowl. Heat for 30 seconds, then stir to combine. Heat for another 30 seconds to 1 minute until the mixture is very warm/hot to the touch. Mix in the egg and vanilla until fully combined, then fold in the flour. Fold in the chocolate chips, being sure not to let them fully melt into the batter. Spoon the brownie batter over the caramel layer, and gently spread out evenly. Bake for 40 – 45 minutes or until the centre is set, and no longer jiggly. Allow to cool completely in the pan on a wire rack before cutting into bars. Want to speed up the cooling time? Place the pan in the fridge or freezer for 1 – 2 hours until completely set and cool. 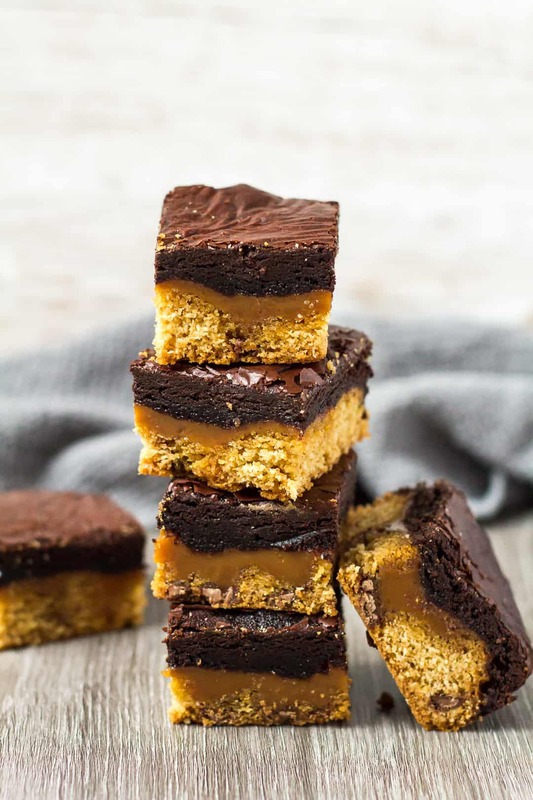 perfect for cookie, caramel, and brownie lovers! How long will these brownies last? These brownies will stay fresh stored in an airtight container at room temperature or in the fridge for up to 1 week. Can I freeze these brownies? Yes. These brownies freeze well for up to 3 months. Thaw overnight in the fridge before serving. More delicious brownies to make! A deliciously thick and chewy chocolate chip cookie layer that is topped with gooey caramel, and finished off with a layer of fudgy brownie! Press the dough into the prepared pan. If the dough is too sticky to work with, use floured hands to press it in. Place the caramels and milk in a microwave-safe bowl, and heat in 30 second intervals, stirring after each one, until melted and smooth. Spread the caramel evenly over the cookie dough layer. Refrigerate whilst preparing the brownie batter. Spoon the batter over the caramel layer, and gently spread out evenly. Bake for 40 - 45 minutes or until the centre is set, and no longer jiggly. Allow to cool completely in the pan on a wire rack before cutting into bars. Brownies stay fresh stored in an airtight container at room temperature or in the fridge for up to 1 week. They also freeze well for up to 3 months. Thaw overnight in the fridge before serving. YES!!! There’s no better combo than sweet chocolate with salty caramel. These are a WIN! These turned out amazing. Perfect when you want it ALL. THESE! These look like the most insanely delicious dessert bar I have ever seen in all my life!! Adding this to my baking list ASAP! Don’t know if mine will look as pretty as yours, but I have no doubt they’ll taste insanely good!